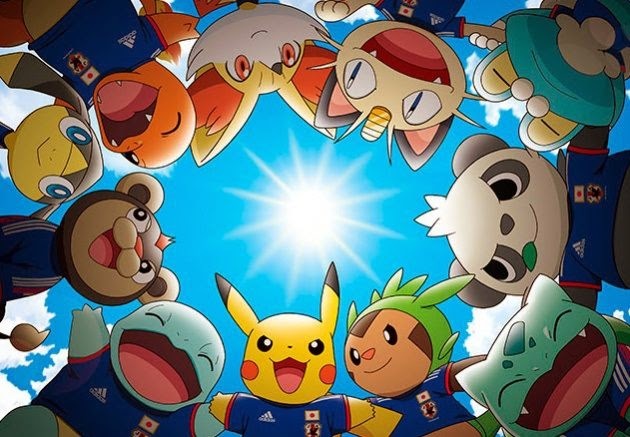 Today it was announced that Pikachu, the small, yellow Pokemon (who closely resembles a friend of mine) will be captaining the supporters for the national team at the World Cup in Brazil in a couple of months. That the announcement was reported to have been made by adidas raises an interesting question. Just exactly how do you pronounce Pokemon and while we're at it, it's addi-das, not adee-das by the way. Around the world Pokemon seems to be pronounced po (as in "poke") ki (as in "key") mon (as in "mon"). Actually, its not too easy to write pronunciations but I hope you get the gist. This is actually a little off base. As with many western words adopted into Japanese "Pokemon" is a contraction of its original English phrase. This is common in Japan so for example a car navigation system is called a "navi" and an air-conitioner is called an "air-con". Interesting the reverse is also occasionally true, for example "bra" and "flu" are always referred to as "brassiere" and "influenza" in Japanese.